"Attention, Kmart shoppers! This is your blue light special..." Although Kmart has tried on and off through the years to resurrect its blue light special (which apparently lives on digitally via its website) I bet it's been decades since you've heard those words announced in a Kmart store. Heck, the last time I visited a Kmart was at least ten years ago, and I've never returned to one since. The store felt old, dirty, messy, and seemed dimly lit. The merchandise, aesthetics, and employees made Walmart look like a Sachs Fifth Avenue. And ever since Kmart purchased Sears, Roebuck and Co. in 2004 it's been nothing but downhill for the two retail giants. In fact, last month it was announced that 108 Kmart stores and 42 Sears locations across the country will be shutting down for good this year. 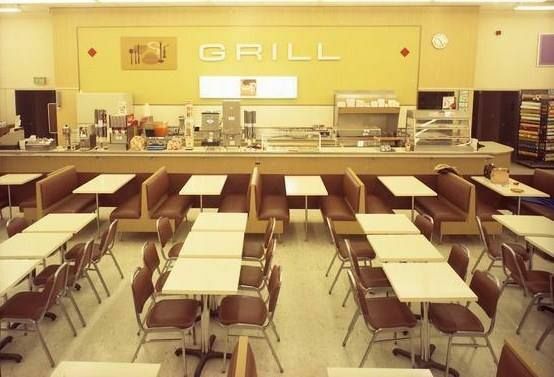 Did you know that Kmart once opened up a small chain of fast food restaurants, called Kmart Chef, at some of its store locations in the late '60s? 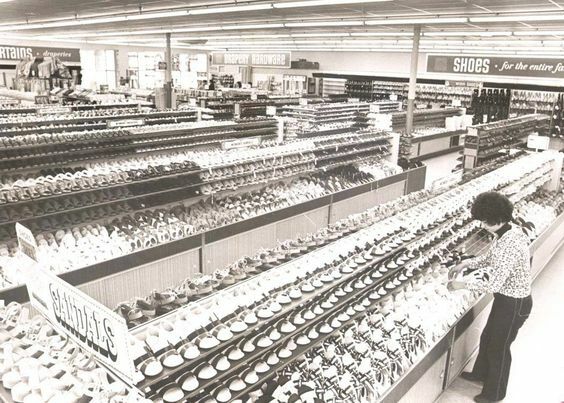 The first one opened in 1967 at its Pontiac, Michigan store. They were free-standing restaurants that served burgers and the usual sides but closed in 1974 after operating at only 11 locations. Through the years Kmart has experimented with introducing similar perks at its stores -- the closest thing to Kmart Chef today is K-Cafe, which serves a full breakfast menu in addition to other food options, but several of these have also been removed from remaining stores. 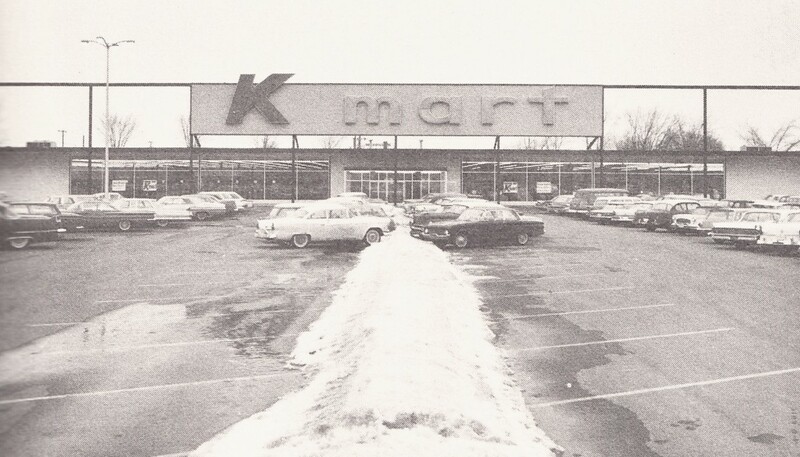 Kmart also has a few odd features that never progressed past one operating prototype, such as Kwash (a laundromat in Iowa City) and Kmart Dental, an in-store dentist office in Miami. 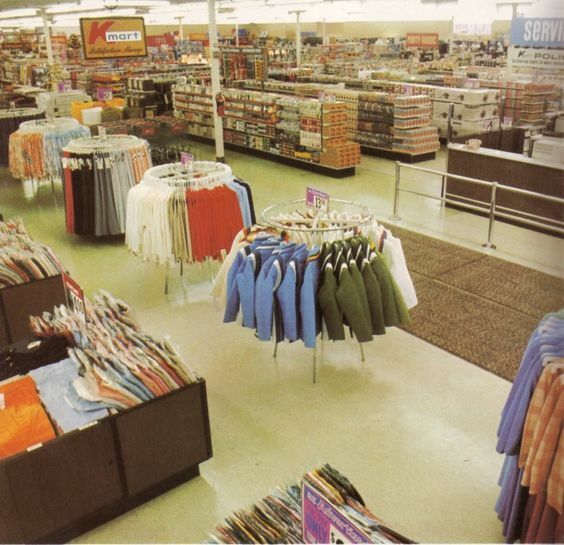 So, let's take a look back at some vintage Kmart imagery from back in the day. I love that there's a cop in this artist's rendering of the store's grand opening. Someone's gotta keep those unruly shoppers in line! 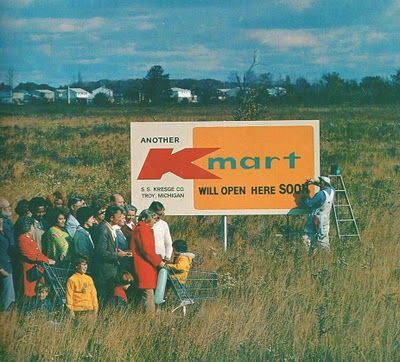 The very first Kmart to open, located in Garden City, Michigan. 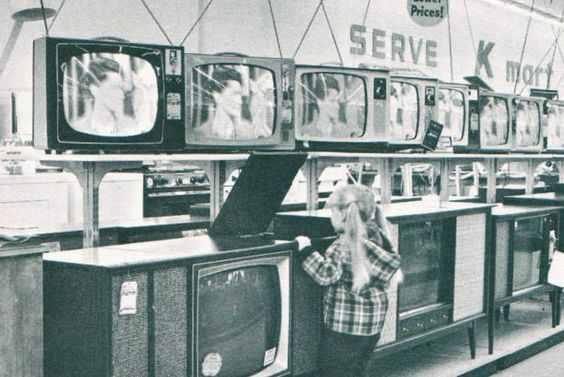 The TV department in the early '60s. 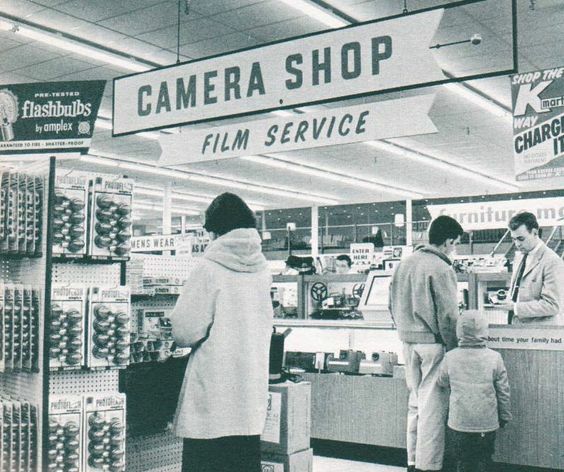 The Kmart camera shop, in the pre-digital days when film needed to be developed. A Kmart Chef restaurant...and double cheeseburgers for 44 cents! The shoe department...so well stocked and neatly displayed! Telescopes for less than $10....a bargain. "And when we're done, you can ride in the trunk with the parcels." Way neater and cleaner looking than the last Kmart I was ever in. Rapid growth in the '60s. 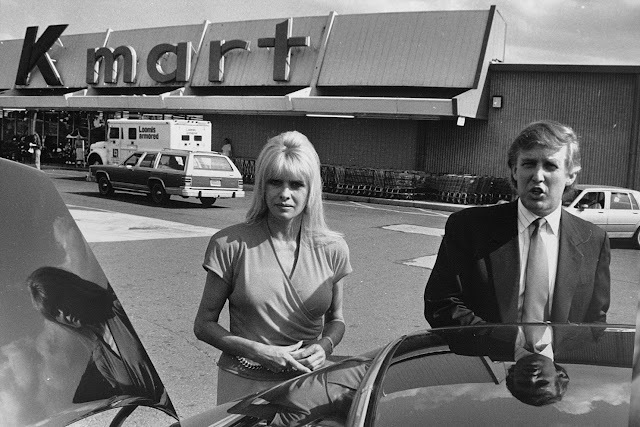 Yes, even President Trump and his first wife visited a Kmart back in the day. The story behind this photo is that the Trumps stopped into the Sanatoga, PA store to buy bedsheets for Don Jr., who was attending Pottstown's Hill School in the 1990s. PLEASE -- no nasty comments -- I'm including this photo for its nostalgic context! And that's one sign we'll probably never see the likes of again. RIP Kmart. The last K-Mart in my town is closing down, and I'm bummed out about it. It was convenient. Not so many people, not the crowds, the noise, the sensory overload. You could go in there and buy a toaster, laundry detergent, whatever, and move at a nice easy pace. I hate going into Wal-Mart. I gotta buy some shoe-strings this month, a couple other things, and now I gotta deal with the parking lot, the noise, and twenty minutes trying to find what I came there for. As Iggy Pop once sang, "I'm buried deep in mass production." Buy the shoe strings at some place less "EXTRA" than Walmart - there must be at least 10 Dollar General's within a 30 minute radius of you. LOL. Or go to Walgreens/RiteAid/CVS...whatever drug store chain is in your area. I avoid Walmart whenever possible even if it means spending a little more. The KMart I shop most often, although that equals probably six times a year, is one that is closing. It's 20 miles from my house and was the second KMart built in our area. The first was an anchor store for a mall back in the mid70s. 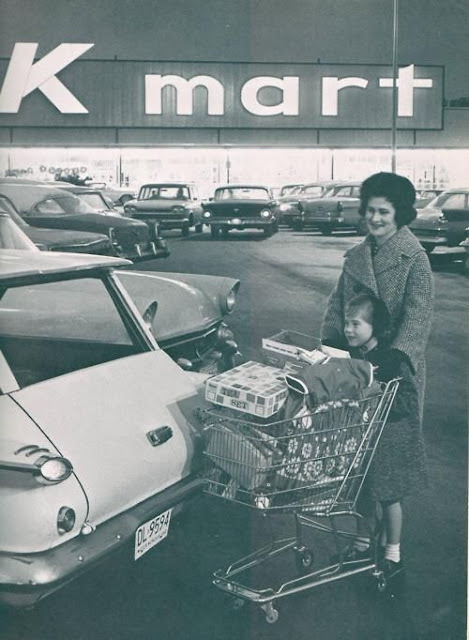 When my son was a toddler and we were still pre-Walmart up here in northern Michigan, we often shopped and then had lunch at KMart. Their cafe pricing was great and the boy loved the chicken strips. I always loved those department store cafeterias, back to my own childhood and going to Woolworths with my Mom. I'm snagging a few good deals with this closing but nothing spectacular. Debbie, I'm a little late, but I have to reply that I also loved the chicken strips in the cafeteria. I'll be turning 40 this year, and my grandpa was the general manger at many Kmarts. Anybody remember Sernetts? That was kinda like a K-Mart deal. Back in the late '70's, early '80's. My mom used to shop in there, with me and my brother in tow, and we would look at the fish in aquariums while she was shopping around. They sold fish there! Also, they had one of those old comic-book spinner racks and I could usually nag my Ma to buy me a couple comics. I still have 'em! We had a Murphy's Mart where I grew up. It had a cafeteria in the back of the store. There are two things I like to get at K-Mart: Joe Boxer pillows and Texas Steer boots. The K-Mart where I live closed down not too long ago. I remember going to K-Mart all the time growing up, and now the last one in my area is one of those that was part of the recent announced closings. I last went to this particular K-Mart a couple years ago, and well....it wasn't the greatest place. I also hate that the Sears I went to all the time as a kid was announced in the recent closings. I remember their snack counter that reeked of popcorn, and getting Frozen Cokes there. I really remember their toy department, and getting all sorts of different 1980s toys there, from He-Man figures, G.I. Joe stuff, Transformers, etc. A beautiful tribute, Pam. I grew up going to Kmart, and back in the '70s and '80s it was often a stop when my family went out shopping. Back then it was bustling with customers, buying up plenty of merchandise. I really regret how both Kmart and Sears, both venerable stores, have gone downhill. I do still shop at Kmart, especially during Christmas because they have layaway. (And Sears too.) Yet, it sometimes feels sad to see these places so much less busy than they used to be, and I guess I anticipate some day hearing on the news that they're closing for good. I hope that isn't so. It seems like so many things I used to love have declined or ceased to be. Thanks everyone for the comments. I have very little memory of Kmart as a kid; Sears and Caldor were the two places I remember going to the most with my parents. How about those giant console TV's? LOL The TV screen wasn't any bigger, it just looked that way. I could rattle off the make and model of most of the cars in the first parking lot. The one in the forefront is a 1963 Ford Falcon. My dad owned a new one. I remember shopping at KMart with my folks (ATTENTION KMART SHOPPERS!!) and then later when I was grown. My last experience reflected your own and I never went back. KMart and Sears have only themselves to blame, the market changed and they didn't. 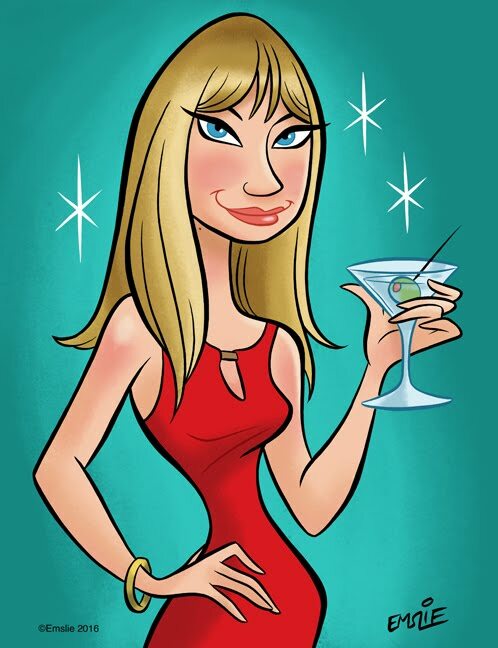 Remember the Penny Marshall commercials? The last Kmart here in Springfield, Missouri is in the process of closing. I've never had the experience you had with Kmart. Most in this area were clean and orderly. There were two close two my apartment. Soon there will be none. A few years ago, the one in my hometown of Lebanon, Missouri closed. People who worked there said it was one of the most profitable in the state. A person working in the Springfield store said corporate wanted to close the stores in Springfield, Branson and Rolla, Missouri (which were fairly profitable) and leave them in major markets where they were not doing good. To me this makes no sense to me. Kmart lost out to Wal Mart just like every other store is now. And sorry, Pam, but I hate dumb Donald Trump and find it ironic that the super-elitist would have gone to Kmart to shop. I moved to the US (Pittsburgh) with my mother from England in the 70s as a toddler and being European we would walk to Kmart daily. We loved it and would always go to the cafe and get fries on that little cardboard dish, great memories. Nice article - I too had a the experience of entering a K-mart store (about 10 years ago), and it was like an abandoned store, that some of us had found, and we wandering around in! I remember a K-Mart by me in like 1980 has a sectioned off restaurant area ... and a cloud of smoke over it! 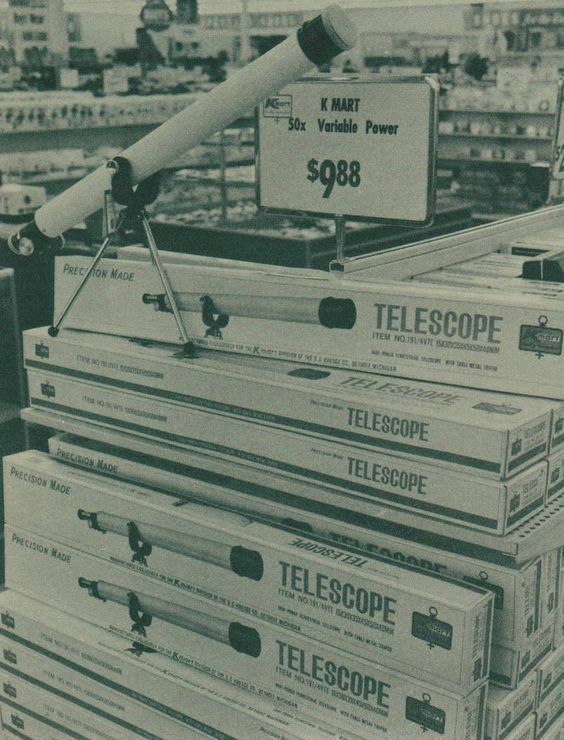 Has everyone heard the (awesome) in-store Christmas music from K-Mart stores in '74? It's on YouTube, and rules! It's great to hear from you, SAHD! I didn't know that about their food line and don't think I saw it mentioned when doing my brief research. Sadly I think Kmart's days are numbered. I delight in my life knowing that I kinda had one foot in the past and one in the future. As a kid I had the chance to enjoy Caldor & K Mart and Woolworths ! As a 20 something I got to work at K Mart & even worked at Woolworth's until the day they closed down all the stores. It was like being a part of history. In this day & age I live in Las Vegas where I am happy to report I have tons of K Marts ! We also have many Walmarts, Kohls, Walgreens, CVS & Target! This town is shop happy & I love it ! The Kmart's out here are nice, but you can definitely compare them to other stores & see the "age" difference, but the ones I visit are quiet & clean & never seem to have to wait too long in line. Over the last few years they have tried to draw attention from the young & hip crowd by having various celebrities head a clothing line such as Selena Gomez, Adam Levine & Nicki Minaj. It was cool because it introduced some unique design patterns, styles & fabrics. The Joe Boxer pajamas bras & underwear are colorful & fun. K Mart is also great because they cater to bigger sizes as well. I tend to choose stores based on what can I get there that I cannot get at their competitors. I was just at K Mart on Friday checking out the holiday merch as that is the main thing I go for. Such cute decorative stuff for Easter ! K Mart is also a store that still offers a great & fair layaway plan. I remember picking up several school dresses with my mom at the layaway counter! 1) An acquaintance worked there years ago as an assistant manager. One very busy Saturday (holiday season) he told a teenage worker to move the blue light from one end of the store to the other as he was making the announcement of the next Blue Light Special. The kid didn't turn off the light while he was moving it with the result that there was a literal stampede of shoppers following him through the store! Good times. My family shopped Kmart when I was growing up, i worked at Kmart in the mid 80s when i was going to college and I shopped there there when my family was young. There are still several stores in my area but they are just a shell of what Kmart use to be. My best memories are from when I worked there. There were many students that worked with me and we had a lot fun while we did what was expected of us. In those days there was a lot of management and they treated us with respect and the customer was king. The general manager was a very classy guy,he addressed us by name and aways asked how we were. 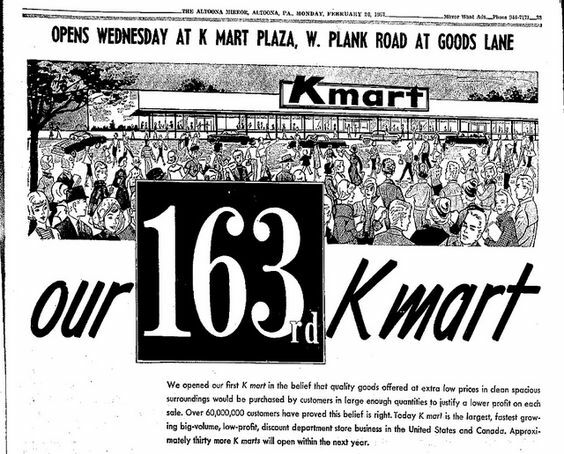 Kmart invented the discount retail segment too bad they lost their way. Our Kmart is closing too, and it is very sad indeed. Our Kmart, until recently, stayed pretty neat and tidy and brightly lit. It was very surreal to be there because it seemed like you were ALWAYS the ONLY person there, lol. I remember when it opened back in the 1970s. As a child I was upset that the previous store, Grants, closed - but I fell in love with Kmart when it came! It has been sad to see them deteriorate so much. Most Kmart stores I've visited during the past 20 have been poorly managed DUMPS. Ours was always nice. So sad. (BTW, the clothing choices for women that they've had recently have been godawful too - I wouldn't wear half that stuff even if I were 85 years old and named Agatha. GaaahhH! I remember when I was a Kid. I lived in a Small Town it has about 6000 people in it, but we had a Kmart, Publix, Win-Dixie, & a Kash N Karry. The Kmart was the goto store. Closest Mall or any other Store was 50miles away. So this was the only store besides the Mom and Pop Stores in the Downtown area. So, Growing Up of course first was Toys, Then Bikes, Then Records and Electronics, The First Nintendo Entertainment System and Gameboy. I miss the Cafe in the Back where they actually Cooked the Food it wasn't Microwaved. My Family Rolling me around in the cart through the different Departments. Blue Light Special. It is funny I'm almost 40years old and when I mention Blue Light Special Most young People today have no clue what I am talking about. Well it didn't take long for Our Store to go down hill, They built a Brand New Big Kmart down the street in the early 90's and I think the WalMart Opened its doors in 2000. After that I noticed Less people at Kmart and Less Items on the Shelves. Till it was gone. I still remember the inside of the Old Store the one with the Restaurant in the back. It is now a Harbor Freight. And the Big K was Torn Down and a Publix was Built in its place with a little Side Plaza. We had a Zayre but they didn't last that long. Oh the Memories. 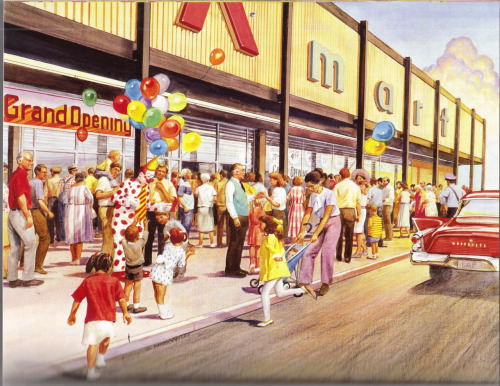 Did you know that Kmart was the First to build and run Super Centers. Look it Up Walmart Copied them and Followed through where as Kmart Stopped building them and before they knew what Happened Walmart Surpassed them in sales. That particular kchef restaurant was located on Glenwood Ave in Pontiac mi in front of the former Kmart. The Kmart and chef closed well before the 2000s but both buildings stand abandoned. The chef became a taco place but closed and the Kmart is heavily delapited and collapsing.